The 2013 Illinois Land Values Conference is coming up quickly! It will be held March 13-14 at the Parke Hotel and Conference Center in Bloomington. The March 14 activities will be open to the public. “These are truly golden years for all of us in agriculture!” Aupperle says. “Farmland values have extended their double digit annual increase through 2012! Our prime farmland is approaching $13,000 per acre, on average, up from $10,500 a year ago. And the rising tide is floating all boats as every class of Illinois farmland increased in value during the past year. “With that in mind, the program committee has put together a great roster of speakers and subjects that should have broad appeal for anyone who has an interest in buying, selling, or renting Illinois farmland.”he continues. The program will open with a review on the status of the Farm Bill, presented by Nicholas Paulson, assistant professor at the University of Illinois College of ACES. That will be followed by a look at the world agricultural economy and how it is affecting commodity prices and the trickle-down to land values. This will be presented by Steve Elemore, Global Economics Director with Dupont Pioneer. 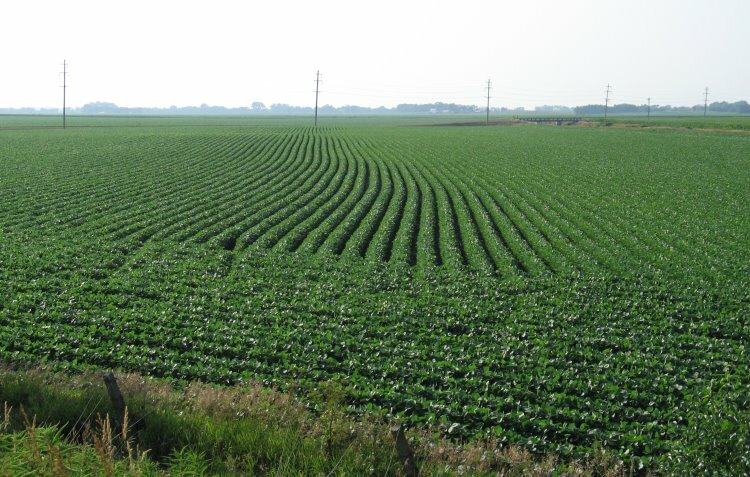 The last element of the half-day program will be the release of the 2013 Land Values and Lease Trends Survey results, which will be covered by Aupperle and Gary Schnitkey, Ph.D., with the University of Illinois College of ACES. “We have been doing this survey for many years and this will be the 2013 edition,” Aupperle notes. “Everyone attending will receive a complimentary copy of the Land Values and Lease Trends Report.” Valued at $15.00, the report this year is 100 pages in size, the largest ever, he explains. Registration for attending the event is $65 which is payable at the door (free to working media). Here’s a list of session information, but for a registration form, you’ll want to download the Conference Agenda. learn how to measure depreciation from market data, when use of cost approach is most and least applicable and how to establish value when using this approach. Discussion will cover physical curable, physical incurable short-lived, physical incurable long lived, functional curable, functional incurable and accrued depreciation. COR 1650– CORE A: AGENCY & ESCROW: Will the Defendant Please Rise? Join us as we explore agency’s fine points – duties to clients – responsibilities to customers – when to do dual agency (when not to!) as well as look at escrow case studies – all with an emphasis on risk reduction. 1:00 – 4:00 p.m. COR 1649 — CORE B: Legal Issues: Anti-trust & Fair Housing – Whatcha Gonna Do When They Come for You? It’s not always what you say that causes you problems – it’s how you say it. Through video examples of what to do – and what not to do – we’ll look at two of the areas of real estate that can cause them to come for you – when you thought you were one of the good guys! Note: Core A and Core B courses are sponsored by the Illinois Association of REALTORS® in conjunction with the Decatur Association of REALTORS® and RLI. There’s an interesting article about transparency and profitability on today’s farms at Brownfield Ag News. Tom Steever spoke with Kay Johnson Smith, the CEO of the Animal Agriculture Alliance. You can hear an interview on the subject here. In a normal year, excellent quality farmland averages over 190 bushels of corn per acre, good quality farmland averages between 170 and 190 bushels per acre, average quality farmland averages between 150 and 170 bushels per acre, and fair quality farmland averages below 150 bushels per acre. “Yields will be below these averages in 2012,” Schnitkey says. Respondents indicated that 2012 corn yields will be 44 percent lower than expected. 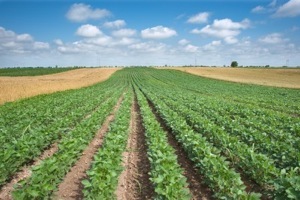 Soy- bean yields in 2012 will be 30 percent lower than expected. McCabe also noted that the volume of farmland being sold during the first half of this year was down slightly when compared to a year ago. “Most survey respondents expect the volume of sales to be at last year’s level or greater during the second half of the year,” he explained. Forty percent expect higher sales volume while 42 per- cent expect the same volume. 1. Respondents indicate that land values increased by 5 percent during the first half of 2012.
what less optimistic. In 2011, 81 percent of respondents expected increases compared to 64 percent this year. 3. Most respondents expect corn prices to average between $7 and $8 per bushel for the 2012 crop. Twenty-eight percent expect prices over $8 per bushel while 63 percent expect average prices between $7 and $8. Nine percent expect prices between below $6. 4. For soybeans, 49 percent of the respondents expect prices between $15 and $16 per bushel. Sixteen percent expect prices above $16. Twenty-one percent expect prices between $14 and $15 and 14 percent expect prices below $14. and expect 2013 rents to average $384 per acre, an $11 per acre increase. 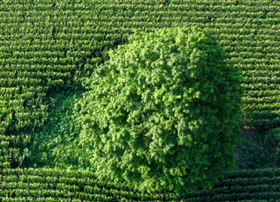 In 2011, respondents expected a $38 per acre increase from 2011 to 2012.
b. Good quality farmland: Respondents indicated that average cash rent in 2012 was $317 per acre and expect 2012 rents to average $326 per acre, a $9 per acre increase. In 2011, respondents expected a $36 per acre increase from 2011 to 2012.
c. Average quality farmland: Respondents indicated that average cash rent in 2012 was $268 per acre and expect 2013 rents to average $272 per acre, a $4 per acre increase. In 2011, respondents expected a $28 per acre increase from 2011 to 2012.
d. Fair quality farmland: Respondents indicated that average cash rent in 2011 was $212 per acre and expect 2013 rents to average $214 per acre, a $2 per acre increase. In 2011, respondents expected a $24 per acre increase from 2011 to 2012. 6. Most respondents expect the 2013 corn price to be between $6 and $7 per bushel: 3 percent believe prices will be above $8 per bushel, 18 percent between $7 and $8 per bushel, 49 percent between $6 and $7 per bushel, 27 percent between $5 and $6 per bushel, and 3 percent below $5 per bushel. 7. Most respondents expect 2013 production costs to increase slightly over 2012 levels. Seventy-six percent be- lieve they will increase slightly, while 5 percent expect large increases. Fourteen percent expect production costs to remain the same. Five percent expect cost decreases. b. Share rent with modifications –13 percent, c. Fixed cash rent – 35 percent, d. Variable cash rent – 20 percent, e. Custom farming – 8 percent. 9. Respondents do not see much change in lease types moving into 2013: a. Share rent (decrease – 5 percent, the same – 90 percent, increase – 5 percent), b. Modified share rent (decrease – 5 percent, the same – 95 percent), c. Cash rent (the same – 100 percent), d. Variable cash rent (the same – 85 percent, increase – 15 percent), and e. Custom farming (decrease – 4 percent, the same – 96 percent). 10. The average supplemental rent on a share rent is $25 per acre. 11. Respondents indicated that 2012 corn yields will be 44 percent lower than expected. Soybean yields in 2012 will be 30 percent lower than expected. 12. Respondents indicated that few 2012 cash rents will be reduced as a result of the drought. Sixty-six percent of respondents indicated that no rents will be reduced while 34 percent of respondents indicated that cash rents will be reduced on less than 25 percent of their farms. 13. The most popular crop insurance product is Revenue Protection (RP). RP accounted for 76 percent of the insured acres. This was following by RP with the harvest price exclusion with 17 percent of acres. Group Risk Income Plan had 5 percent of the acres, followed by Yield Protection with 2 percent of the acres. 14. Coverage levels on RP polices were: a. 60% or lower coverage levels: 1 percent of acres, b. 65% coverage level: 3 percent, c. 70% coverage level: 15 percent, d. 75% coverage level: 24 percent, e. 80% coverage level 35 percent, and f. 85% coverage level: 22 percent. 15. Seventy-five percent of respondents believe that the drought will have no impact on farmland prices. Fifteen percent expected prices to decrease as a result of the drought and 10 percent expected farmland prices to rise. 17. Overall, respondents’ expect the 2012 drought to have limited impacts on farmland prices and cash rents. 18. The average charge for on-farm grain bin storage is $.14 per bushel. 19. The average charge for pasture is $40 per acre. 20. Respondents were asked an open ended question on what are the most important factors influencing farm- land prices over the next 12 months. The most common answers are grain prices and interest rates. Other re- sponses included politics and the 2012 election, legislation (Farm Bill, tax policies), returns on alternative invest- ments, crop expenses, investor demand, and local yields this and next year. The 2012 Land Values Report from the ISPFMRA is available! Here’s a peek at what we found. Land prices and returns to farmland leases have continued their strong move up, uninterrupted now for a several year run, hitting new highs almost month by month. Just a year ago, a look back at 2010 indicated excellent to good farmland had hit $8,000 to $9,000 an acre. Last summer’s mid-year survey indicated land values had moved up 10 percent to 15 percent during just the first six months of 2011, with the best quality land surpassing $10,000/ac. at that time. ISPFMRA is offering a course titled “Using Excel® in Specified Appraisal Applications” on August 15th in Champaign, Illinois. 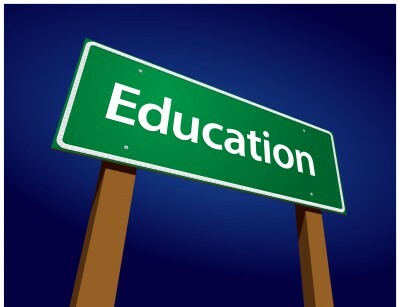 The course will run all day (8am-5pm) at the Hilton Garden Inn. For the beginner to advanced user, this seminar will move attendees from basic spreadsheet concepts to advanced analytical techniques. Everyone will pick up hints and techniques for adding graphics, formatting and debugging. Participants will be able to use Excel appropriately in each of the approaches and gain objective mathematical tools for adjustments. Appraisers and managers will learn to compare sales using soils data, land-use mix and building mix through automated scoring. This course qualifies for 8 hours of Professional Continuing Education Credits. Laptop and thumb drive required. references, importing from outside sources and exporting data to other programs. Join us on the ISPFMRA Summer Tour 2012! Events include University of Illinois Agronomy Day, a crop production technology update, and a tour of the University of Illinois Ag Library. Download the agenda and registration form for details. If you register by August 6, you get the earlybird rate of $80. 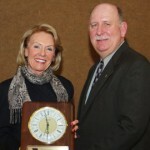 Joyce Watson, president and CEO of the Illinois Agricultural Leadership Foundation, was presented with the Outstanding Service to Illinois Agriculture Award by the Illinois Society of Professional Farm Managers and Rural Appraisers at that organization’s annual meeting held here February 16. The Foundation sponsors the Illinois Agricultural Leadership Program, an advanced leadership development program for emerging Illinois production agriculture and agribusiness men and women. “It is with great pride that I present this award to a very special person, professional and mentor,” said Bret Cude, AFM, immediate past president of the Society and a previous ‘graduate’ of the Leadership Program. Watson is the founding director of the leadership program and became the Foundation’s first chief executive in 1982. In her capacity she is responsible for all programming, management, and fund raising activities of the Foundation, including the Leadership Development Program. The program has received national and international recognition. In accepting the award, Watkins noted that the original purpose of the leadership program was to “foster” a new bumper crop across the state…a finely-honed harvest of the best and brightest agricultural leaders. “We’ve done remarkably well,’ she said. Admission to the program is limited to men and women ages 25 – 49 who are employed full-time in production agriculture or ag-related occupations. Each ‘class’ meets during a 24-month period and has at least one international trip as well as programs across the U.S. Funding is covered by the individuals and by contributions through the Foundation. 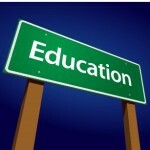 The first program was in 1982 and the Class of 2012 is currently underway. A number of past ‘students’, who are also Society members, were on hand at the awards program. The Outstanding Service to Illinois Agriculture Award has been presented annually by the Society since 1940. Its previous recipients have included state governors, state directors and federal secretarys of agriculture, educators, and other leading Illinois citizens who have been involved with agriculture in the state. J erry R. Hicks, AFM, partner and treasurer of Agrivest, Inc., Springfield, IL, was inducted into the Illinois Society of Professional Farm Managers and Rural Appraisers’ Hall of Fame during the organization’s annual meeting held here recently. Hicks is a 1971 graduate of the University of Illinois with a bachelor’s degree in agriculture, majoring in animal science. He followed up that degree with a master’s in 1976 with advanced studies in agriculture communications. 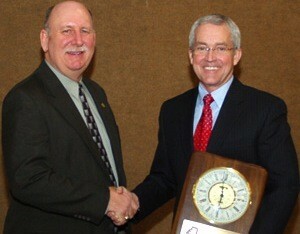 He was a member of the Illinois Agricultural Leadership program class of 1984. Hicks started his career in agriculture as an assistant and associate agricultural advisor with U of Il Extension Services in Dixon, IL. From there he served as executive vice president of the Illinois Pork Producers association. He left that position to go into farm management and was named senior farm management officer with FFG Agrivest (successor to First National Bank) in 1994. He assumed his current title when Agrivest became an independent organization in 2000.. He has continued seeking professional improvement education and received his Accredited Farm Manager designation from the American Society of Farm Managers and Rural Appraisers in 1986, and became an Illinois-licensed Real Estate broker in 2000. His ‘outside’ leadership activities have included 24 years as a 4-H leader, chairman of the University of Illinois Cooperative Extension Services State Extension Advisory Council, treasurer of the Illinois Agricultural Legislative Event Committee, a member of the U of I College of Agriculture Deans Advisory Committee, vice president of the Pleasant Plains School board, and president of Extension Partners. 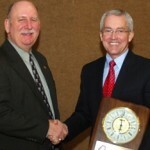 The Society has inducted members into its Hall of Fame since 1980, “and Jerry joins a long list of individuals who have shown outstanding leadership within the organization and within the industry of agriculture in Illinois,” Cude stated. Here are 30 facts culled from the 2012 Illinois Land Value report. 1. Both Land Values and Lease Trends continue higher into 2012, and are expected to stay strong as long as crop income levels hold or increase. 2. Price and rent levels both increased steadily through 2011, and consistently among different productivity classes of land and regions of the state. 3. Land values maintain support from investment capital seeking alternatives to other financial assets. Among major issues are interest rates, U.S. and foreign sovereign debt, stock market performance, the dollar value relative to other currencies, and growth of consumer economies around the world. 4. Long leasehold interests, extended Conservation Reserve Program (CRP) contracts, deed restrictions, etc. that nega- tively impact ownership control penalize land prices. 5. As supplies of land tightened buyers were less concerned about one year leases, and receiving partial interests in cur- rent year crop or leases in progress, looking beyond a few months toward long term investment value. 6. The annually renewable USDA Farm Program appears to have very little effect on land values in 2011, eclipsed by other more dominant factors. 7. Current crop genetics increase yields while reducing year-to-year variability, which improves earning potential for lower classes of land. 8. Recreational tracts and transitional development land have been hardest hit because of struggling non-agricultural economies. 9. Some areas or counties carry name or reputation prestige, showing stronger prices than land with similar productivity and attributes in nearby areas or counties. However, undiscovered “pockets of prosperity” where land can be typi- cally purchased at lower prices relative to its productivity are fewer and further between. 10. Regardless of the means of sale – public or sealed bid auction, broker listing, private transactions – excellent and good productivity tracts needed minimal marketing time, with a generally shorter period from exposure-to-market through sale to closing. 11. Not only are farmers the majority of buyers, but adjoining/nearby landowners and current tenants often lead the way. 12. Areas with higher concentrations of livestock – dairy, hogs, poultry – had generally more favorable markets for their production in 2011. 13. Pasture rents have not moved significantly over several years, and can vary widely from $5/ac to more than $60/acre depending on quality or carrying capacity, water source, and contribution to upkeep and maintenance of the land and fences. 14. Variable cash rent leases grow in popularity and pay landowners competitively higher returns in 2011 due to higher average prices and excellent soybean yields. 15. Wind farm activity, where already planned or under construction, continued to impact land values and add to total return in 2011. However changes in tax, policy, and funding have slowed the progress of many wind tower projects. 16. In some areas larger percentage increases for lower productivity land were noted, based on expectations of improv- ing crop returns, and absolute increases on lower values resulting in larger percentage growth. 17. Continuing fixed cash rent rates generally showed a tendency to lag other lease and operating contracts as income returns and commodity markets have been in a general up trend over several successive crop years. 18. By year end 2011 price paid per productivity index (PI) point per acre was running in the upper $60s to mid $70s. One central Illinois region’s data calculated excellent soils averaging $73/PI, good soils $64/PI, and average and fair soils at $60/PI. 19. In many areas of the state it was a challenging crop production year in 2011, with wide variations in conditions from too much rain at times in some locations, to very hot and dry conditions in some areas later in the summer. 21. The generally wet spring throughout the state accentuated the importance of good drainage and much drainage tile and waterway improvement work was done throughout the year. Well-drained or pattern-tiled land will sell for a premium, especially if there are well-documented and accurate maps of drainage improvements. 22. Land value for crop production continues to gain on values for development land, as cropland increases and develop- ment land declines or holds steady. 23. The number of tracts and amount of acres transacted was generally more than previous years, as higher prices pulled supply onto the market. 24. In some local instances proposals for underground gas storage, recent discovery of production volumes of oil, and continuing coal mining has sensitized the market to the value of mineral interests and rights. 25. Irrigated land returned proportionately higher income due to higher commodity prices and improved yield from irrigation. 26. Farm operators continued and expanded the trend of bringing current landlords and other absentee investors to the farmland market. 27. In 2011 there have been several notable expansions or new construction of high capacity grain rail-loading facilities, mostly destined to move Illinois grain to cattle, hog, and poultry operations out of state. 28. Some areas benefit with strong grain prices from grain market outlets on navigable rivers, rail terminals, local area end-users and specialty food product processors. 29. Another year in 2011 where corn following soybeans, rather than one or more years of corn, performed significantly better. 30. Almost every county in the state had instances of a record new high price per acre for farmland. The prices being paid for farmland across Illinois continue their upward spiral with the tops being in the $10,000 to $13,000 per acre range across the state. This is according to the 2012 Farmland Values and Lease Trends Report released today by the Illinois Society of Professional Farm Managers and Rural Appraisers at its annual Land Values Conference. The top price of $13,000 per acre was for a November 2011 sale of 37.7 acres in Christian County. The property was listed as having Excellent quality land. Sales in the $10,000 per acre range were common across a number of regions in the state.